The article reports that the 32-year-old driver of the pick-up was arrested on suspicion of reckless driving and child endangerment two felonies. There were three children in the pickup truck’s backseat at the time of the incident. Police do not believe drugs or alcohol were involved. The Insurance Information Institute (“III”) recently updated its Motorcycle Crashes fact page. Citing data from the National Highway Traffic Safety Administration (“NHTSA”), the III reports that 4,586 people died in motorcycle crashes in the U.S. during 2014. This was a slight decrease from the 4,692 deaths in 2013. Sadly, however, the number of injuries in motorcycle crashes increased from approximately 88,000 in 2013 to approximately 92,000 in 2014. After the accident involving two teenage motorcycle riders, we were curious about the ages of those involved in motorcycle crashes. Interestingly, the III focuses primarily on older riders noting that 55% of motorcyclists who died in crashes in 2013 were age 40 or older. This is a significant shift with the number of riders 40 and over killed in motorcycle crashes increasing 39% since 2004 (versus a 16% increase in overall motorcycle deaths). Likewise, the average age of motorcycle riders who perished in crashes was 42 in 2013 compared to 38 in 2004. The III also cites research suggesting older riders are more likely to incur serious injuries in motorcycle crashes than younger riders. It is worth noting that the cited research study focused solely on riders aged 20 years and older. What about teens? A Young Drivers fact sheet released by the NHTSA this May reports that 225 motorcycle operators between the ages of 15 and 20 died in crashes in 2014, a decrease from the 235 young motorcycle operators killed in 2013. However, the number of young motorcycle operators injured in crashes shot up 24% from an estimated 6,000 in 2013 to an estimated 7,000 in 2014. These figures do not include the number of teenage motorcycle passengers injured and killed in motorcycle crashes. 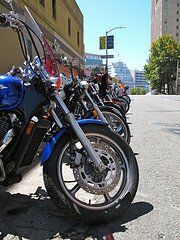 The Brod Law Firm believes motorcyclists of all ages are entitled to safe travels. If you were injured or lost a family member in a motorcycle crash in Northern California, please call our team. As a motorcycle accident law firm in Santa Rosa, San Francisco, and Oakland, we may be able to help you obtain compensation from those at fault.